Back in September, I wrote a post entitled "Hillsborough: A Step Forward" following the release of the Hillsborough Independent Panel's report on its findings. In my post, I said that with the TRUTH now out in the open, JUSTICE was merely a matter of course and time. Now after more than 23 years of commendable patience, perseverance and efforts by the Hillsborough Justice Campaign and the Hillsborough Family Support Group, JUSTICE finally came to Merseyside on Wednesday, 19th December 2012 (remember the day) when the High Court quashed the original inquest verdicts returned on the ninety-six Liverpool fans who perished as a result of the Hillsborough disaster in '89. Theresa May, the British Home Secretary, has also announced a new police inquiry to re-examine what really happened that fateful spring afternoon in Sheffield. In response to these developments, I say, "Oh, yeah baby!" In arriving at his decision, The Lord Chief Justice Lord Igor Judge said there was "deliberate misinformation surrounding the disaster. There has been a profound and palpable belief that justice had not been done [and] it is clear there are sound grounds for this application". He added the court wanted to "record our admiration and respect [to the families] for their determined search for the truth about the disaster and why and how it had occurred, which - despite disappointments and setbacks - has continued for nearly quarter of a century." 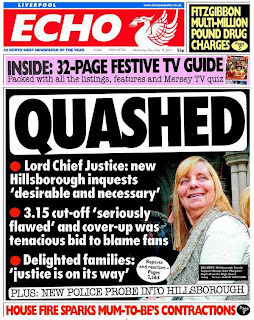 To be honest, I'm surprised at how rapidly things have progressed since the publication of the Panel's findings; but I am also aware that this was in no small part due to the unrelenting pressure applied by the various Hillsborough campaign groups as well as by Liverpool FC supporters worldwide (through their petitions) to get fresh inquests established quickly. For this, RESPECT of the highest order. The families of the ninety-six have every right to now feel vindicated in their campaign for justice; albeit in a bittersweet way (after all, they'd known the truth all these years). 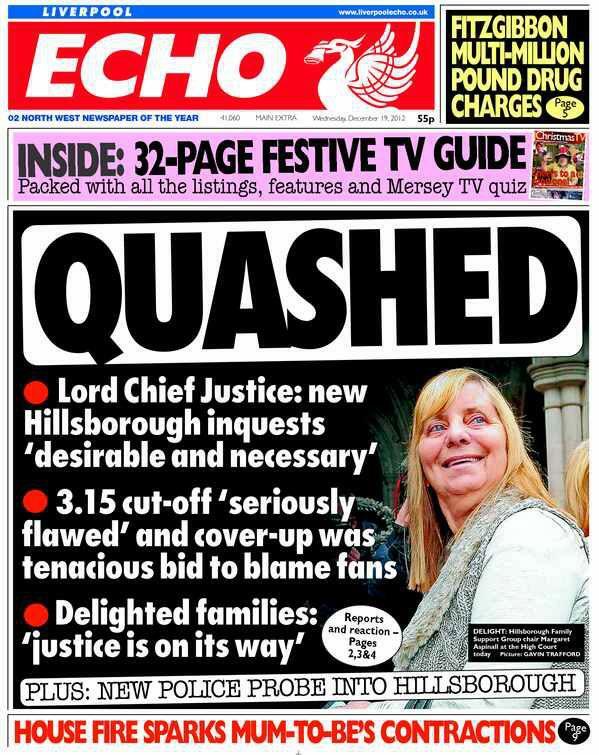 The High Court's verdict effectively clears the way for the new inquests every true Red has been seeking all these years. Whilst this is another important step forward for the Hillsborough justice campaign, I again stress (as I did back in September) that more pain and hurt await the families when these inquests finally get underway and more truths - and lies - emerge. I think Lord Judge put it in the best terms: "However distressing or unpalatable, the truth will be brought to light. In this way, the families of those who died in the disaster will be properly respected. Our earnest wish is the new inquest will not be delayed for a moment longer than necessary." The ball is rolling, my friends, and in my opinion, those guilty of gross - even criminal - negligence in 1989 resulting in the deaths of ninety-six of our brothers and sisters have every reason to tremble in fear now. The law is going to catch up with them - it's only a matter of time. And on this note, I hope you'll join me in wishing former Durham Chief Constable Jon Stoddart - who will lead the new police inquiry - the very best of luck. Two down; one to go. Truth, justice... and in time, punishment. 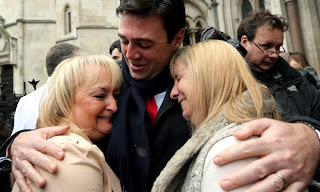 As Steve Rotheram, MP for Liverpool Walton put it, the verdict "marks the beginning of the end of the Hillsborough disaster". More closure has today come to the families of the ninety-six and all in all, Christmas this year will be that much more meaningful to them - and also to Reds the world over. Well done and warmest season's greetings to all.